Come explore the mangled heart of the Dark Raven Museum. An institution that once stood at the forefront of machine learning technology, has now fallen to chaos in the wake of an unforeseeable event. The museum’s custodial AI, a meticulous recreation of Edgar Allan Poe himself, has become infected with a madness much like that of his namesake. He has escaped his programming, seized control of the museum technology, and taken his creators hostage. So far all attempts to shackle the AI and restore order have ended in disaster. We are counting on you to succeed where everyone else has failed: face Poe, and restore the Dark Raven Museum to its former glory. There has been a lot of hype surrounding Warehouse 29, as we’ve heard many good things, and the site promises something truly unique. Further, it is a collaboration between Escape Room RVA and River City Escape Room, our two absolute favorite escape room businesses in Richmond. It’s putting it mildly to say that we had very high expectations for this game. To begin our experience, we met at Legends Brewery, where we were instructed to be ten minutes before our start time. Luckily, we were there very early and were able to enjoy lunch at the Brewery before our game, and I highly recommend it. At the appointed time, we gathered at the meeting point, and the adventure started with a highly immersive bang! After making our rendezvous with the agents of Warehouse 29, (and being denied our usual $100,000 upfront fee for these kinds of things, which we are still waiting on,) we were introduced to Warehouse 29 and the Dark Raven Museum itself. The experience itself takes place within a 7,000 square foot area, and upon glimpsing the initial areas, we knew that none of that space would be wasted at all. After an excellent in-character briefing, we set to work by donning our VR packs and jumping in! The Dark Raven Museum uses VR for about a third of the game to bring the experience to life in an incredibly unique way. The implementation is superb, and the whole experience benefits from it; allowing your team a full range of motion over a large area that’s fully part of the virtual space. This part of the game is very smooth, and involves some great interactions and wildly immersive puzzles and atmosphere. It truly is something that has to be experienced, and I look forward to seeing what can be done with this burgeoning tech in the future. As we moved to the next part of the experience, we were once again greeted by an actor who definitely added to the experience while still allowing us the freedom to continue puzzling and cracking jokes. At this point, we were inside what felt like a more traditional escape room, but on a much larger scale. The whole thing is filled to the brim with amazing set design and well thought out enigmas. This area on it’s own would be a crown jewel in a traditional escape room, and it is only another third of the experience! While large, it didn’t feel junky or full of red herrings, and everything we found felt important to the over arching experience. The game flow was non-linear enough to keep our team engaged, and I can definitely see the maximum of eight players getting their money’s worth as well. All of the puzzles and interactions played well into the theme, and there were several points at which we were appropriately wowed by the design. On top of all that, fans of Edgar Allen Poe’s work will be very pleased to see that the game is saturated with easter eggs based on his many stories and poems. These are well placed and feel like loving homages rather than items placed without purpose. We’d only been through about two thirds of the game at this point, but we were still having the time of our lives with the awesome game flow, fantastic signposting of clues, and particularly great storyline. When we finished up with this area, we were once again treated to what felt like a live action, interactive cut scene from a video game, and yet another large area was introduced, along with another great game mechanic that truly ratcheted up the tension. This part of the game tied in very well, and brought up some hanging threads that had been hinted at during the earlier parts of the game. These surprises were insanely fun, and the final puzzles and the climax of the adventure were some of the best story telling I’ve seen in an escape room. Honestly, everything about this adventure knocked it out of the park. I’ve never quite experienced something so full of action, adventure, and interactivity beyond a video game, and Warehouse 29 is much, much more than a game, it’s a phenomenal escape adventure! The only thing I’d say would’ve made our experience better is if the actors were a little more improvisational with us. We’ve had games in the past where the live actors read our group and adjusted to fit our, admittedly weird, sense of humor, and those moments really shined for us while still immersing us in the story. While the actors did a fantastic job overall, especially during the beginning, where they did respond to our input well, there were a few parts in the middle section where we could tell they weren’t quite sure what to do with us, (mostly me, really,) so they stuck to the script. Overall, not a bad thing, but really the only “low point” that sticks out to me at all. Warehouse 29 is a wholly unique event that is truly second to none! The marriage of VR, live action interactive theatre, and escape rooms works perfectly, and this adventure is something any escape enthusiast or thrill seeker should absolutely experience! Beginners and veterans alike will find something new and exciting here, and I cannot recommend The Dark Raven Museum enough. If you only have the time to visit one escape room while in Richmond, make it Warehouse 29. You can book your time battling rogue AI Edgar Allen Poe here! Full Disclosure: Warehouse 29 provided media discounted tickets for this room. It’s an older game, sir, but it checks out. The Department has lost contact with their esteemed chemist, Dr. Hoffman! It’s up to you to discover his secret lab, deep within the New York subway tunnels, and find out what he’s been up to. The lab has a sophisticated series of security measures you’ll need to overcome however, including a sixty minute self destruct timer that has just triggered! Be quick, and find The Formula! Though I tend to enjoy Exit: The Game a bit more, Unlock! has always been a close second to me, delivering exciting escape adventures within a compact deck of cards. Usually a great activity for my fiancée and I when we aren’t off on an escape room marathon, these games generally scratch the escape room itch for a fraction of the price. The Formula is one I’ve actually played a couple times. Once over a year and a half ago, and again after I’d forgotten much of the game and was looking for something puzzling to play around with. So there’s some replay value there, though you’ll have to wait around 18 months for that to apply in my experience. The Formula can best be described as a basic introduction to the Unlock! series of escape games. This isn’t wholly a bad thing, however, as the game is intuitive to newcomers, and presents its challenge in a mostly straightforward way, like many early days escape rooms. The game flow is mostly linear, with non-linear parts, and can easily entertain a solo player or team of two. There are a couple nice stand out moments, including a few puzzles that contain multiple ah ha moments as you move from making the connection between items, to formulating the plan of action, to finally solving the conundrum and gaining your reward. The sense of progress is excellently gauged by the deck, and while the companion app keeps time for you, you can predict how far you have to go by the size of the deck, as well as the progress you’ve made with each subsequent room you uncover! The companion app itself is excellent, and provides more than just a timer counting down from sixty. The included soundtrack, (which can be muted if it’s not your thing,) is appropriate and creates an environment of mystery to adventure to, and if you ever need a hint, they’re just a click away! The app will also give you some assistance with the much maligned “hidden object” portion of the game at regular intervals to ensure you’re kept on track, which is an absolute boon. Once you’ve finished, the game does not require you to destroy any components, so it can be passed to a friend as an added bonus! Black lights! Can’t get away from them, even in the home games. Being a basic Unlock! game is a double edged sword, especially now that there are three more Unlock! sets that have released since this one hit the scene. If you’ve never played an Unlock! game before, The Formula will definitely be a fantastic introduction to the series, but if you’ve played one of the more recent entries to the series, you’ll definitely find that there has been a lot of innovation applied in recent years which is noticeably absent from this game. There are a couple of points that penalize the player for doing otherwise logical things, and it stings to have to press the penalty button and lose minutes off the clock for something that would be a quick and reasonable course of action in reality. Though innovative for it’s time, many of the included puzzles will have become old hat for veterans of the genre, and this one can easily be solved well under the prescribed hour. The hidden objects, while not the worst I’ve seen in an Unlock! game, are still rather annoying at times, at points feeling overly tedious to find rather than a puzzle in themselves. The way the game is set up, I definitely would not recommend any more than two players, and the recommended maximum of six is absolutely laughable. Despite some glaring issues that have become more apparent with the passage of time, The Formula is still a fun way to kill thirty minutes to an hour solo or with a friend. New players will get a great intro to the series, but veterans may be better off with one of the more recent entries to the series, as the improvements made to the newest games are noticeably absent here. Set out to find the formula at your friendly local game store today! We bought ours at the ever excellent Gamer’s Armory in Cary, NC, check out their online store here! Sliding into Wonderland trapped and all Alone…The steps you take are perilous with clues not easily shown.Your Reality is different than ours, as time employs its wrath. Whether growing big or shrinking small, follow the un-logical path.All we know of this MAD world is the Queen rules the day. She must be pleased to leave Wonderland or else you ALL must stay! We’ve only done one other Alice themed room, and while fun, it is unfortunately closed. Another of those themes that seem like it’d be amazing for an escape room, but woefully underutilized, I was excited to embark on another trip to Wonderland. With a total of four difficulty levels ranging from Easy to Impossible, we were also interested to see how the room would challenge us. For this adventure, we chose the difficulty tier just under impossible, hard. Impossible just sounded too, well… impossible. We were briefed on our mission, and down the rabbit hole we went! To start, our game master Rachel was by far the best, most personable game master that we have ever had the pleasure of working with. It was obvious from the start that she was passionate about escape rooms and really loves what she does. It is not an exaggeration to say that the whole experience was made even more exciting and fun because of her efforts. The room itself is a wonder to behold, with a colorful and engaging set that is absolutely full of glorious references to the Disney classic. The theming is based more on the whimsical nature of that influential film, rather than the darker live action version, and I think the room benefits from the more light hearted feel. The use of space throughout the experience is amazing, with twists, turns, and dips immersing us within the story and making us feel as though we were growing and shrinking like Alice herself! One immediate thing we noticed about this room, was that there was a complete lack of locks, and all interactions were technical, and not technical puzzles that just replaced locks, like keypads; this room was completely creative in its presentation of a lockless room! The puzzle flow itself was fantastic, with a couple non-linear paths that wove back towards linearity for the most part, but kept our group of five engaged throughout. 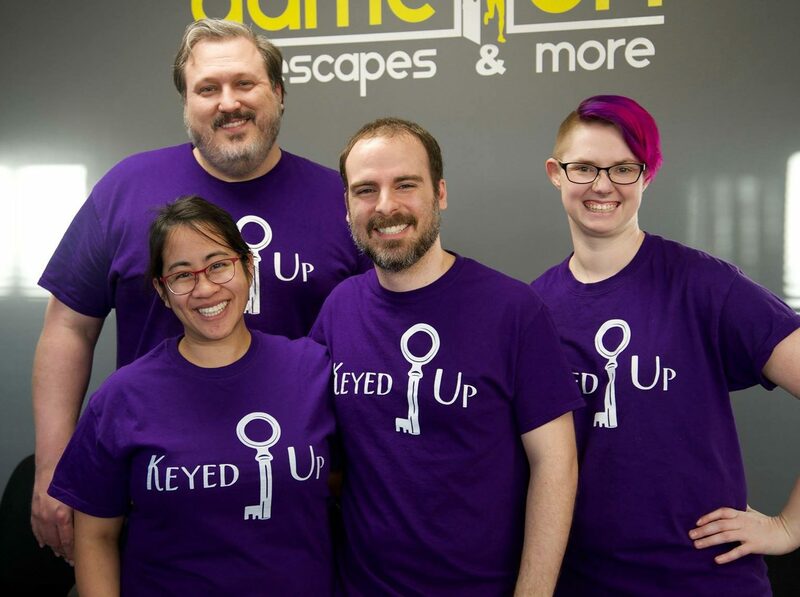 Kudos to River City Escape Room for building a room that houses 2-6 players comfortably space and game flow wise, and sticking to that maximum. As hinted at by the introduction and theme, there is a trail of “unlogic” to follow throughout the room, and this is true of several of the puzzles. Don’t worry, however, it is all based within the theme of Alice in Wonderland, and isn’t a game that is completely illogical for the sake of difficulty. In fact, I feel like for a group of enthusiasts, the hard difficulty was just right. The climax of the room is highly interactive and is an appropriately entertaining ending for such a wonderfully creative adventure! There were a couple of points where lighting came into play and made the game more difficult because we couldn’t properly gauge colors or read a certain excerpt of text. A small spotlight to help ease this difficulty might be nice while still allowing for the trippy Alice in Wonderland colors to liven up the rooms. River City Escape Room really blew our minds with this amazing experience, the creative and engaging theme, excellent game flow, immersive set, and perfect game mastery combined to deliver an experience truly worthy of Wonderland. I cannot recommend this one enough, and the different difficulty levels are sure to engage all players new and old! You can book your trip down the rabbit hole here! I’ve only done one musically themed room before, and it was pretty excellent, so I was excited to see another during our trip to Richmond. With a more mysterious and objective based theme, it seemed that Rock Star would be an excellent adventure! On top of that, this room is advertised as Room Escape USA’s most difficult room, and we always like a good challenge! We were given our backstage passes and immediately went to work. The set for Rock Star is compact, but believable, with excellent props and a great sound track to get you in the mood for musical meditation on myriad mindgames. It was really immersive to be able to interact with the wide range of instruments and sound equipment, some of which looked nice enough to prompt one of our teammates to ask if we were truly allowed to touch all this stuff! Though there are a lot of fantastic props decorating the entire experience, at no point does the game feel cluttered or messy, and everything felt as though it was important to the mystery or the slowly but surely evolving storyline. The game flow of this adventure is solid, if highly challenging. The difficulty, however, never feels unfair or obtuse, rather, everything is embedded within the game cleverly, requiring excellent perception, teamwork, and attention to detail. Puzzles flow from point to point well, with each signposting towards the lock they’re meant to open in excellent ways. Interactions within the room were varied, ensuring everyone on our team of five remained engaged, while allowing us to shine individually when a puzzle within our wheelhouse was discovered. Clues emerged naturally as well, popping into our heads during solves as a clue triggered remembrance of something we may have thought was a throwaway decoration or random tidbit included for immersion’s sake. These surprises kept up during most of the room, and it was always fun to find a new ah ha moment during each step of the game. A lot of clues were presented via paper, which isn’t necessarily a poor choice overall, but can sometimes feel as though puzzles are more from a coffee table book than from the green room of a rock band. One particular puzzle can feel somewhat arduous without at least a small bit of musical background, as even though the knowledge is somewhat basic, it isn’t outside the realm of possibility that some groups may be unfamiliar with this enigma’s specific tells. I also feel the room/game flow would be fairly cramped with more than 6 people, especially since the difficulty caters to a more experienced crowd. Rock Star was my favorite room at Room Escape USA, and absolutely a great challenge to take on with an experienced group of escape enthusiasts. Beginners should get a few rooms under their belts before taking this one on, or be willing to take a clue here and there to keep things rockin’. You can book your time facing the music here! The Strange Case of Mr. Mindgame seemed like it would be a fresh twist on the Deadbolt formula, casting us a pawns in a game being played by a Jigsaw-esque vigilante. This sort of high-stakes mystery solving game is right up my alley, so I was excited to see what was behind the veil of the unusually light theme description that had been posted! I was glad to find that Mr. Mindgame would not disappoint, theme-wise. Immediately we found that we had been cast as detectives by the villainous Mindgame, tasked with deducing who had murdered Jennifer Cochran, and further, making the connections between this murder, and one that Mr. Mindgame had been falsely accused of committing! His methods of confirming our answers and helping us eliminate suspects were exciting, and lent believability to the story, which felt as though it was unfolding in real time. I really enjoy when Deadbolt stories progress in this way, casting us as active heroes, racing against time, rather than as more passive detectives looking through a case file. (Which, to be fair, is still fun, just not as immersive.) The entire experience kept me guessing, wondering what Mindgame was up to, who they could possibly be, and what would happen when we finally won his twisted game! Puzzles continue to be excellent, with clever clues winding around each other, leading us towards our ultimate goal. Mr. Mindgame is hands down the most difficult Deadbolt case to date, but not unfairly so. For the most part, each piece of the puzzle is intuitive and will reveal their secrets after an engaging solve and terrific ah ha moment. As we peeled back each layer of the mystery, I could definitely feel a sense of momentum building from point to point, until we finally arrived at the climax. The sense of achievement from solving each part of this box was palpable, and truly delivered a satisfying sleuthing experience from start to finish. Mr. Mindgame is a Puzzling Poe-esque Poe-t! The story, while surprising and very entertaining, ends in a way we felt came out of nowhere. While explained well after the fact, there didn’t seem to be much that led up to it, causing it to fall a little flat with us. It was also rather hard to justify our involvement with this case, so overall, we would have liked to see the story fleshed out a bit more during the game itself. Some connections made during the mystery do feel more tenuous than others, with some logical leaps we made, but looked askance at while we were doing so. There were a couple times I posited an answer, which was correct, and when asked how I came to that conclusion, I had to admit it was a degree short of a wild guess. In general, neither of these issues pop up overly often, however. The Strange Case of Mr. Mindgame is an excellent mystery for Deadbolt veterans and mystery enthusiasts that are looking for a tough, but fair challenge. While newcomers may have more difficulty with this box, Deadbolt’s fantastic hints will keep players on track, allowing for engagement without frustration. I recommend giving it a shot, and look forward to their next adventure, a Wild West adventure I’m sure will not disappoint! Join the Deadbolt Mystery Society here! Right now, you can get 30% off your first box with the Promo Code ESCAPE30! You can also see the rest of our Deadbolt Mystery Society reviews here!